As a Gulf Coast owned and operated company, we know the impact military support has on the community. Our area is called home by many active and retired military members, and in order to thank you for your service, we offer features tailored to fit any circumstance and lifestyle. 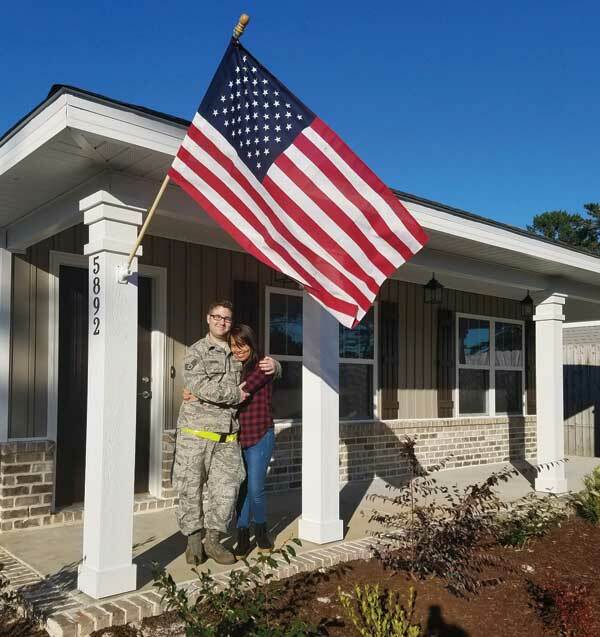 Whether you are looking to build your first home, forever home or just want to remodel, the team at FlynnBuilt is ready to assist you and offer military support to make your transitions easier. Building a home is a large investment, our team understands this. We work with all of our customers throughout the entire home building process in order to guarantee satisfactory results. When it comes to being in the military, you may not always be in the area or have access to view your home’s progress. But with FlynnBuilt, you have access to building your home remotely. At FlynnBuilt, military support is shown by offering exclusive services many builders don’t have. We want every customer to have access to their project from the moment it starts until it is complete. When you build a home with our team, you have access to progress despite your location. You can count on high-quality customer service that matches our building standards. We treat every FlynnBuilt project as if it were our own home. In order to offer military service members an easy building process, whether deployed or relocating, we offer Skype chats and a builder app for your phone. With these Skype chats, customers are able to choose their home features like paint colors, fixtures, upgrades and more. We will also go over updates on the building progress. Although you may be deployed or in another location, the Flynnbuilt team shows military support by offering the ability to access your home information from anywhere, at any time. Building your home remotely has never been so easy. Another feature offered when building with FlynnBuilt is access to our builder software app. The builder allows you to have access to your project virtually. If you are experiencing military relocation and are currently housed somewhere else, the builder software app allows you the ability to witness your home’s progress unfolding in front of you. With the builder software app, you will receive weekly updates that include photographs and descriptions your progress. This allows you to ensure the home is remaining on schedule. It also helps to avoid any confusion since digital sign-offs are required. Another great feature on the home builder app includes the ability to select finishes and décor elements you want in the home. At FlynnBuilt, our main priority is you. We understand that in choosing our team of expert builders, you are placing a lot of trust in us to make your dream home a reality. Having the ability to build a home remotely is a large part of us taking every effort possible to ensure a seamless home building process. Despite your location, we want you to be involved every step of the way. Supporting the military is important to our team. The Gulf Coast area is called home to many who are active in the service and we want every Pensacola resident to have the opportunity to build their first or forever home, despite their current location. In addition to offering remote services like Skype chats and the builder software app, at FlynnBuilt we offer standards that are other builders upgrades. When choosing FlynnBuilt, you choose a team who works for you and with you. Each project set before us is treated as if it were our own. The FlynnBuilt team is known for offering high-quality construction and customer service. You can expect complete transparency throughout the entire building process. When a question or concern arises, our team will answer it. We don’t just build homes, we build relationships. Military support is important to the team at FlynnBuilt. Whether you are actively deployed or experiencing military relocation, contact our team today for more information regarding getting started on your new home!